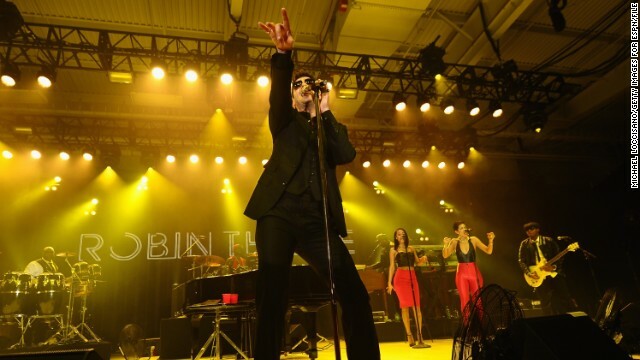 As his marriage with Paula Patton unravels, Robin Thicke is leaning on his fans for support. On Wednesday, after pulling out of three previously scheduled performances, Thicke made his first public statement since he announced February 24 that he and his actress wife are separating. "I want to thank everyone for the well wishes these last few days. My fans mean everything to me," Thicke said in a statement posted to his website Wednesday. Thicke's instinct to reassure his supporters of their importance makes sense, as the R&B crooner has had to let some of them down. The "Blurred Lines" singer intended to perform last Friday in Atlanta, but he ended up canceling that show and the next one in Orlando that Saturday due to vocal issues. By Monday, though, his voice wasn't the only troublesome thing. Amid his scrapped sets, Thicke released a joint statement with his now estranged wife to confirm that they were splitting up after close to nine years of marriage. "We will always love each other and be best friends, however, we have mutually decided to separate at this time," the couple said Monday. Thicke was supposed to soldier on to North Carolina on Tuesday, but he pulled out of that gig as well because of "unforeseen circumstances." Hopefully for Thicke's fans (and those who've bought tickets to see his shows), he'll soon get back on track. "I’m looking forward to getting back on out on the road and performing in Washington DC this Thursday, and the rest of the tour," Thicke said in his statement Wednesday. "Looking forward to seeing everyone out there!" It is pretty crazy to think that album Blurred Lines came out July of last year and it is still being talked about. But something that is upsetting to see is that he is separating with his wife Paula, a person who he has been with almost his whole life. I do hope that they get back together but in reality, due to the ‘rock star’ life that Robin Thicke wants to live, I doubt that will ever happen. There has been two times that the media caught him possible cheating on his wife. Not to mention that if he was caught twice by the media, how many times did he possibly cheat on his wife in which he did not get caught? I did like the fact that he acknowledged his fans by saying that he was sorry for missing the concerts. I also like how he is getting back on track with his career and is not allowing this whole situation with Paula to ruin his life. I feel like when he says that they still love each other but are splitting up, he is almost acting as if they will get back together. Time will tell, and hopefully everything works out for him. Thicke is still lookin gangsta. I'd love to be his cellmate.